WTMD and Towson University Public Media provides experiential learning experiences to students who are interested in learning about the radio and music industry. WTMD believes that students should be well prepared to interview for their first position and our internship program is geared toward those students who articulate a strong desire enter the public or commercial radio industries, new media ventures or the music industry. Internships are unpaid. Preference is given to Towson University students who will earn academic credit for their experience. 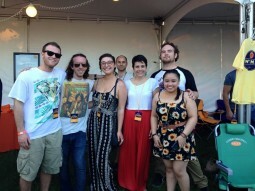 However, WTMD does accept interns from all institutions of higher learning. WTMD makes internship opportunities available to select high school students whose schools require a community service or internship experience in order to graduate. All applicants are expected to have developed a significant understanding of WTMD’s music, programming and mission by listening to the station, subscribing to WTMD’s e-newsletter, visiting our web and social media pages and attending WTMD events prior to application. The convergence of media across all platforms requires radio stations to develop and repurpose content across the air, digital and visual platforms. Interns who have video experience will record and edit, post and promote in-studio performances. Radio is a game of details. Interns will input, edit and assign meta-data to songs, promotional announcements and other elements destined for air or digital platforms. Events are a significant part of WTMD’s revenues and positioning. Interns will set up and break down events, including; setting up the chairs; assisting with band load ins and outs; staffing the WTMD membership tent or table at off site events; and participate fully in executing Live Lunch, First Thursdays Concerts in the Park among others. You can’t escape the intern administrative duties, as they are foundation of every part of WTMD’s mission and programming. You can expect to file CDs, stuff envelopes, organize the storage closets, assist staff in their general duties and answer phones (including taking requests and taking member donations). Interns must commit a minimum of 15 hours a week to their internship. While scheduling is flexible, interns can expect to be required to attend evening and weekend events. All interns must participate in WTMD’s Fund Drives by taking membership contributions on the phones, picking up meals from local restaurants for our staff, interns and volunteers. Interns are expected to be motivated members of the WTMD staff. Successful interns are sometimes asked to continue on with WTMD as part time staff or volunteers. Interns will be furnished with a final report to their institution and possibly a letter of recommendation for future employment. First check with your academic unit to make sure you are eligible for academic credit. Submit a resume, cover letter stating your interests and what you will bring to the WTMD staff and a copy of your department’s paperwork. Internship candidates will be interviewed by one or more members of the WTMD staff prior to being accepted into the WTMD internship program. Applicants are expected to apply for a position as early as possible, preferably 2-4 week prior to semester their internship is to begin.